The announcement came at the same time the Museum revealed a 20-year partnership with the Mark Rothko family. The children of Mark Rothko,Christopher Rothko and Kate Rothko Prizel will lend the Museum Mark Rothko’s paintings over the next two decades. 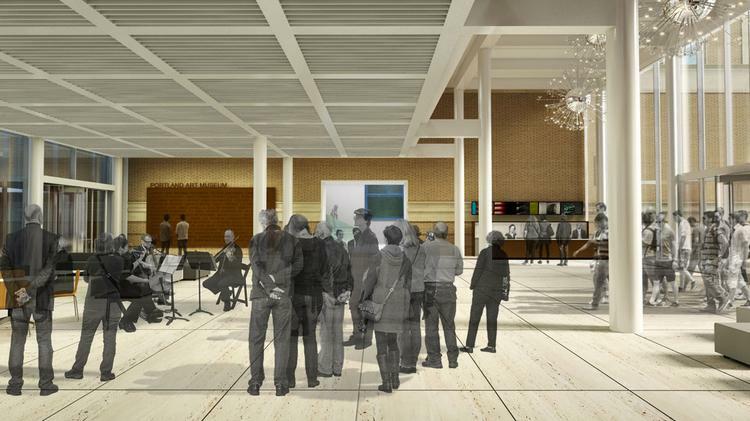 A rendering of the Rothko Pavilion’s north lobby. The expansion is set to feature a glass-walled building called the Rothko Pavillon. Mark Rothko lived in Portland in his youth. An anonymous $8 million donor made the gift so that the pavilion could be named in Rothko’s honor. Museum leaders said the project, on which groundbreaking will take place in 2018, could tie the campus together better with its surrounding neighborhood and reduce the Museum’s carbon footprint. The project, set to be completed in 2020 or 2021. At the same time, the Museum had launched a $75 million capital and endowment campaign, of which the Rothko Pavilion is now the major piece. Chicago-based Vinci Hamp Architects is designing the three-story Rothko Pavilion, which will add roughly 30,000 square feet of space to the Museum. It will “be anchored by a glass-walled stair tower that will connect the Pavilion to the Museum’s Main Building,” according to the group.